This is a Concerto for Classical Guitar and Orchestra which I composed in 2008 and completed in 2015. The concerto is written in the Classical style of the 18th and early 19th century much like the music of Fernando Sor or Mauro Giuliani. The main idea of the first and second movements are based on a theme I wrote when I was 10. 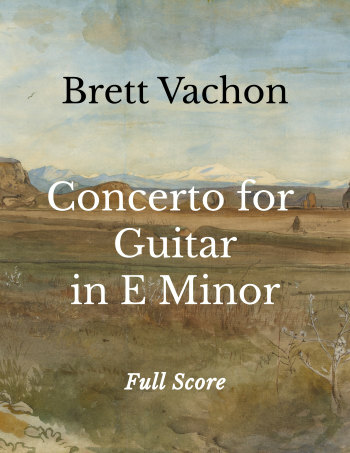 I had wanted to write this concerto for the longest time because I felt that even though there are a large number of high quality, beautifully written works for classical guitar in the Romantic style, the vast majority are for solo guitar without accompaniment. This is probably due to the fact that the guitar in the 19th century was a small instrument without much carrying power. The guitar was more suited to an intimate setting rather than in front of a large crowd in a big concert hall. The modern instrument has a slightly louder sound that can also be further increased by amplification. Although in this work I've tried not to overdo the orchestration when the solo instrument is playing with the orchestra, so theoretically it should be possible to play without amplification and still be heard. If you are interested in seeing the full score can follow along with the score and recording on Soundslice.